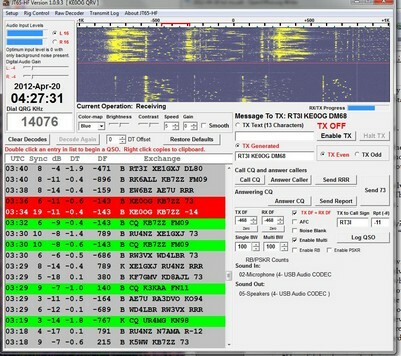 JT-65 screen shot, showing the QSO with KB7ZZ in red. Not much detail is exchanged, but all the basics for a legitimate, logable QSO are there. JT-65 is a digital communications mode that I’ve heard about. It sounded horribly complex, with many variables that all must be just right. Well, that’s true. Today I received a newsletter from West Mountain Radio with yet another article about JT-65. They also mentioned where I could download “soundcard” software: http://jt65-hf.sourceforge.net. So, I gave it a try. It took quite awhile to get set up properly and I even had to consult the manual a few times. I’m already set up for digital modes with Ham Radio Deluxe (HRD) and a SignaLink USB sound card interface. As it turns out, the JT-65 software works quite well with HRD and in fact needs it to be running at the same time. After much twiddling of knobs and changing various parameters here and there, including on my Ten-Tec Jupiter, it started receiving signals. Pretty cool! Unlike PSK-31, all the JT-65 signals seem to pile on top of each other, but the software can sort them out. Tentatively, I tried answering a CQ. I had to let the system go a few rounds until I got the transmit levels sorted out, but before long, I answered KB7ZZ’s CQ and actually had a legitimate QSO! Woohoo! JT-65 originated with moonbounce in mind and specializes in weak signal work. It isn’t really designed for ragchewing and pretty much limits you to the basics: callsign, signal strength (automatically determined by the decoding algorithm), and location (coded in the form of grid squares). It’s the hot new thing and is said to be great for working DX (long-distance contacts with hams in other countries). Indeed, I saw CQs from all over Europe, including Russia. I shall investigate this more! This entry was posted in Ham Radio blog entries and tagged JT-65. Bookmark the permalink.